2016 claims another '80s pop culture star as actress Carrie Fisher has died at age 60. Just a day after pop music icon George Michael passed away, Fisher apparently succumbed to health issues initially reported last weekend. Her mother Debbie Reynolds released a statement earlier this week that she was in stable condition after reports surfaced she had heart failure on a plane trip from London to Los Angeles. Then yesterday afternoon it was made public that she had indeed passed away. It has been a brutal year for losing several world-famous pop culture celebrities and now losing Michael and Fisher in consecutive days to close out 2016 seems unfair. The daughter of pop singer Eddie Fisher and actress Debbie Reynolds seemed destined for a Hollywood career. Of course, Fisher's rise to international fame came as Princess Leia Organa in the 1977 film Star Wars and its sequels in the early '80s. She would be featured in over 40 films throughout her career, half of those in a 12 year stretch from 1980-1992. In 2015 (and in the upcoming 2017 installment,) Fisher reprised her Star Wars role in the continuation of the saga. Although I hold the original Star Wars trilogy close at heart, there are two other '80s films featuring Fisher that I adore. The first is The Blues Brothers in which she portrayed a mysterious woman out for vengeance against Jake. 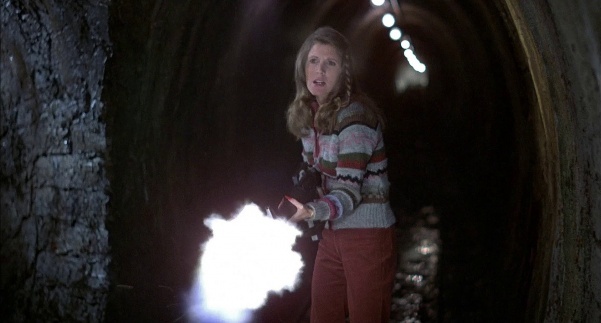 She appears several times throughout the film attempting to kill him before finally cornering Jake with an machine gun. Jake pleads for his life and Fisher's character believes him, allowing Jake and Elwood to proceed with their "mission from God." It was a silly role but the first one that I remember seeing her in outside of Star Wars. The explanation for her wrath against Jake almost seemed to make her like a deserving Princess who was left at the alter by her scoundrel of a Prince. Fisher is also in another comedy favorite of mine that was released in 1989. She played Carol Peterson in The 'Burbs, the wife of Tom Hanks' character Ray Peterson who is essentially the voice of reason throughout the movie. She really holds her own against the neighborhood guys who try to involve her husband in the snooping antics. Her personality really matches Hanks to point of arguing and defending her family against the half-cocked theories of the "neighbors from hell." In fact, it takes a deception to lure her away from home and disobey her commands to not get involved. Outside of Star Wars, this is probably my favorite role by Fisher. Fisher had many other supporting roles in '80s film and television but those two are my favorites. I invite you to leave your memories of Carrie Fisher in the comments.